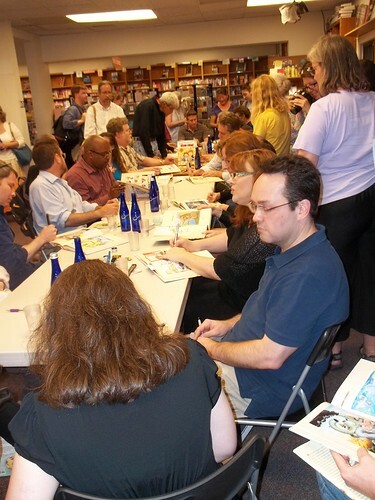 Steve and Kathy Artley have photographs of the Team Cul de Sac signing at Politics and Prose online now. Steve is a political cartoonist who contributed to the book and auction. Last night's signing brought out about 18 cartoonists - some pictures can be seen here. From Peter Dunlap-Shohl: "I will be able to make it to the Politics and Prose signing, and look forward to meeting all who show up." Peter lives in Anchorage, Alaska but amazingly will be at Politics and Prose this Wednesday night! And unfortunately, he's also a cartoonist with Parkinson's disease. Come out and support the Team with Peter. 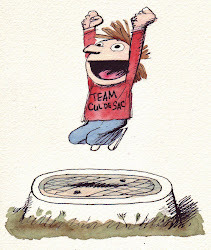 Here is a nice article about Team Cul de Sac and my wonderful business partner, Jamie King. Labels: A nice photo of me. Pointing to Petey's dirty socks.